Culminating point in its short history, the laurels for the only German win over a works Ferrari in the covered period, albeit only in a qualifying heat, belong to AFM. Here is the story behind this small marque. After the Veritas story the second chapter should logically be devoted to AFM. Regarding Formula 2, the achievements and also the number of manufactured cars of this make are almost equal on terms with Veritas. But AFM never achieved the same level of publicity. This is perhaps not only due to this company's much more restricted potential, but also to team founder von Falkenhausen's sense of reality, while such modesty was unknown at Veritas, where Loof publicly announced one over-ambitious project after the other. So AFM concentrated mostly on the Formula 2 programme, always remaining within the company's limits, technically and financially. Von Falkenhausen in his good old faithful BMW 328 in the race of the 1500cc sports cars at Hockenheim 1947. AFM can be regarded more or less as a one-man affair. This is also expressed by the three letters, which simply stand for Alexander von Falkenhausen, München (Munich). Before the war von Falkenhausen had already taken part in some motorcycle trials before switching to a BMW 328 for sports car races in 1939. Of course his career was interrupted by the war, when he became chief of the BMW motorcycle development department. After armistice von Falkenhausen became one of the pioneers of German post-war racing, as he took part in the very first race, the Ruhestein hillclimb in July 1946. Like most of his fellow drivers in this race he relied on one of the approved pre-war BMW 328 sports cars. With this he finished second behind Lang's Mille Miglia Limousine. He appeared again at the next event, the first circuit race at Karlsruhe, where he entered the race car class as well as in the sports car category. Interestingly he won in both races, at least on the road, where he even managed to overtake Brütsch's powerful supercharged Alfa Romeo Monza. But some strange rule disallowed cars which took part in the race car class to be used in a sports car event and so he was deprived of his victory after the race. Having already gained some experience in engine tuning he developed a 1500cc racing engine out of some old BMW parts, so he was able to enter also the smaller sports car class in 1947. 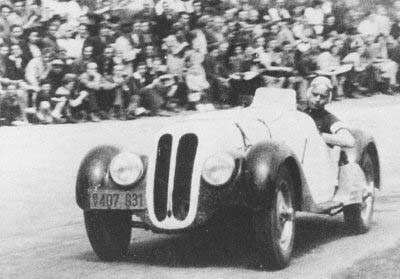 The picture shows him in his BMW 328, in which he won his class in the season-opening Hockenheim race. Von Falkenhausen's first self-built race car, the "Intertype" in sports car shape. Here a picture of 1948. Von Falkenhausen soon realised that the old BMW 328 chassis could not fulfill the requirements of a modern race car any longer. So he combined an original 328 frame with the more modern rear axle of the 326 model, fitting it with new bodywork of so-called Intertype style. The reason for this layout was the option to convert the car from a two-seated sports car into a offset single seater simply by stripping it off its detachable lights and wings. With the additional choice between the small or the big engine this gave von Falkenhausen quite a number of occasions to enter the car. Nowadays there is some of confusion as von Falkenhausen entered his home-built special initially as an Al-Fa (not to be confused with the famous Milan factory) which the editors of some early race programmes turned into Alfa-BMW before he switched to the AFM letter combination! This warning is also valid for a third engine of his design, a 1100cc, which was based on a Fiat 4-cylinder engine. Von Falkenhausen, looking for a commercial base for his activities, set up a small production series of this engine, which achieved much success as a popular platform for special builders. In the debut race for the AFM marque, the 2-litre sports car class at Hockenheim, von Falkenhausen immediately showed the competitiveness of the car by finishing second, again behind the Mille Miglia Limousine of Kling, while later in the year he also won the 1.5-litre class at Hamburg. As von Falkenhausen soon realised that it would be much more promising to concentrate on one class only rather than his permanent switches, the car was fitted with the smaller 1500cc engine for 1948. Together with some minor modifications to the bodywork this is the configuration in which the picture was taken. In that season he won the races at Hockenheim, Cologne and the Eggberg hillclimb to become German Sports Car Champion of the 1.5-litre class. 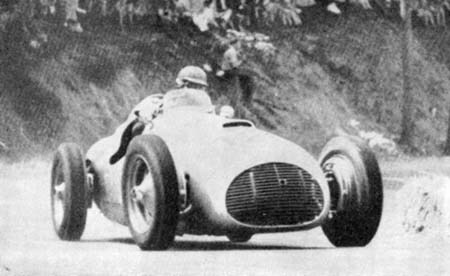 After that he sold the car to Peter Hirt from Switzerland for the 1949 season. 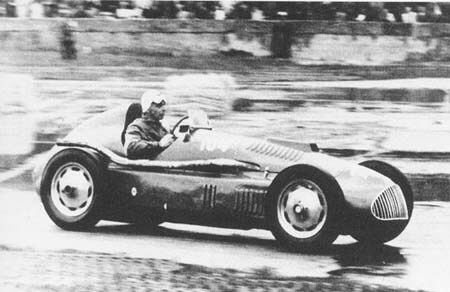 Von Falkenhausen in his first monoposto at the Munich-Riem airfield in 1949. 1949 saw the appearance of the first AFM monoposto. Of course this was again built around the only purposeful and available engine, the faithful BMW 328, which had naturally received some AFM-style modifications, so that it should rather be called an AFM-BMW. Because of the limited engine options von Falkenhausen had to concentrate on chassis design to achieve competitiveness. The result was a very revolutionary chassis, a true spaceframe layout, extremely light and stiff. So in fact the car can be regarded as a predecessor of the Mercedes 300SL and Maserati's famous "Birdcage", while in contrast the spaceframe of the Veritas RS still was mounted on a conventional tube section frame. But von Falkenhausen's innovations did not stop here. For better roadholding he chose a de Dion rear axle, with an additional transmission, consisting of two pinions, installed between the differential and the drive shaft. This allowed the shaft to be mounted in quite a steep angle, which gave way for a very low position of the driver within the chassis. Another big advantage of this layout was the fact that by chosing from different pinions for the additional transmission the car could very easily be adapted to different track characteristics. Further improvements were related to the brake system. In contrast to the fashion of the time von Falkenhausen already used a twin-circuit hydraulic brake with adjustable balance between the front and rear wheels. The brake drums itself were cast as an integral part of the wheels, in order to decrease unsprung weight. The chassis was completed at Fritz Hahn's garage in Stuttgart, while again the bodywork was made by Willi Huber at the Chiemsee. After its completion the car weighed only 420kg and certainly was one of the most modern of race cars of its time. This fact soon became evident by some outstanding race performances. Alas, these could not be translated into results because of its engine limitations. The problem about the BMW 328 engine - which of course affected nearly all of the German manufacturers - was the general weakness of its crankshaft bearings. In post-war Germany there was simply a lack of technology and raw materials to produce parts of high-quality standard. So what had been enough for the engine's original power output of just around 80hp in 1936 was by far insufficient to endure up to 140hp, which some of its tuners finally achieved. As a consequence the cars were only just reliable enough for the comparatively short German races, and even there the attrition rate was very high. Altogether two of these cars were built. While the first one was used by von Falkenhausen himself in Formula 2 events (remarkably painted all in red! ), the second one was sold to Emil Vorster with an 750cc supercharged Fiat-based AFM engine installed, suitable for the so-called Kleinstrennwagen ("smallest car") class, a predecessor of Formula 3 in Germany. Later this car was also uprated to Formula 2 specification by fitting a 2-litre BMW engine when sold to Willi Heeks. Von Falkenhausen gave the car its race debut at Hockenheim. Unfortunately, dring practice the engine failed due to the known problems, so he had to extract the standard BMW engine out of his road car overnight and start the race from last position of the grid. Therefore his performance must be regarded even higher, when he left the rest of the field behind, only pursued by Ulmen's Veritas RS streamliner. In the end he had to be content with second place in a true sprint to the finish line, beaten by only 0.7 seconds. At the next race at the Munich-Riem airfield von Falkenhausen again had to face problems during practice. Here Hans Stuck made his first appearance in the AFM cockpit. But after only a few practice laps a cardan shaft broke and von Falkenhausen had to sacrifice yet another night to be ready in time for the race. In very wet conditions he took an initial lead after the start, only to crash out of the race during the first lap. Things did not go any better at the Schottenring, where von Falkenhausen at least finished but only in fourth position. Stuck in the original spaceframe AFM monoposto at the Monza Grand Prix 1949. 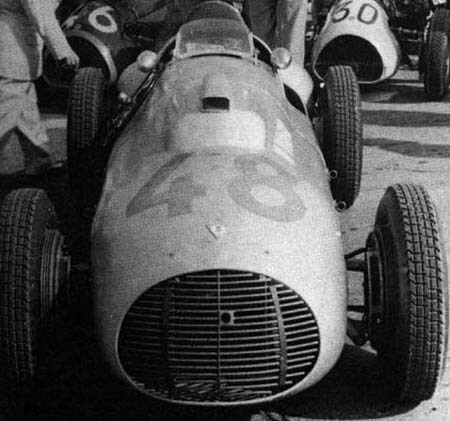 At the beginning of the 1949 season Stuck had found himself without a drive after the collapse of Piero Dusio's Cisitalia company, for which he had raced in 1948. So he and von Falkenhausen soon found an agreement for the benefit of both of them. For Stuck the AFM presented an opportunity to re-enter racing at an competitive level, even with the "factory" backing he had searched for. On the other hand von Falkenhausen expected to benefit from the promotional effect by the engagement of a driver whose name was still very well known not only within Germany but also in the racing scene outside the German border. And Stuck was in possession of an Austrian passport and racing license. For von Falkenhausen this was a welcome loophole to enter the international racing stage, when the ban on Germany was still into effect there. Quickly the bonnet of the car was painted white, so that it appeared in Austrian race colours, and Stuck made an entry for the Monza Grand Prix at the end of June, which was one of the most important Formula 2 races of the season. 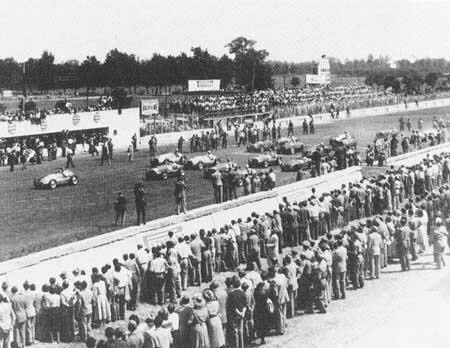 The start of the 1949 Monza Grand Prix. Right in front Hans Stuck in the AFM. This picture is really a historical one for German post-war motorsport. It shows the very first start of a German car/driver combination in a race outside Germany. And what a debut this was in front of an international public! At the moment when the picture was taken Stuck had already gained a comfortable lead into the first lap from his front-row grid position, after setting a sensational fourth fastest time in practice. The shot makes it very clear that the torque of the long-stroke BMW engine in combination with the lightness of the chassis must have given the car quite an advantage in acceleration, even against the works V12 Ferraris of Fangio, Ascari and Villoresi. In the usual Monza slipstream battle Stuck's lead lasted during the first three laps, before he was overtaken by the Ferraris of Fangio, Ascari, Bonetto and Villoresi. He managed to stay in contention with the leading group until his engine lost power due to a broken ignition cable. This dropped him down the order and after another lengthy pitstop he had to be content with seventh place, finishing eight laps behind the winner. But the race had been an impressive show of the potential of the car and so von Falkenhausen could book it as a success. Stuck also dropped out early in the next race at the Garda Lake, but back home again he finally scored the first victory for AFM in the race car class at the Schauinsland hillclimb. Being already well-known as the Bergmeister Stuck could be regarded as having this type of races as his personal domain, but the opposition seems to have been very weak as he beat the runner-up by two minutes (!) on the comparatively short track. Stuck was again behind the wheel at the following race at the Nürburgring, where he jumped the start into an overwhelming lead until finally the engine failed once again. 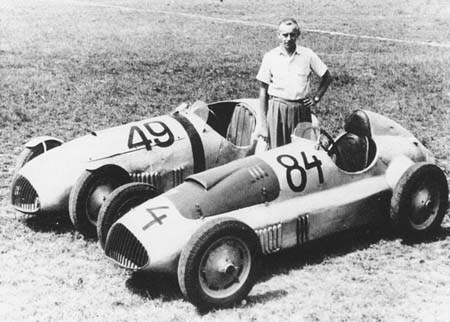 Von Falkenhausen stands between his AFM Type 1949 monoposto (probably the supercharged 750cc car) and the 1100 cc sports car. 1949 was really a hot motorsport season for von Falkenhausen, as the AFM was entered in eleven Formula 2 events, among them the race at Lausanne (where Stuck took also part in the Formula 1 race, from which he retired early). But surprisingly the car lasted for the whole distance of the Formula 2 race and Stuck scored a good fourth place there. This fine performance was supplemented by a third at the ultra-fast Grenzlandring (where Stuck clearly had some disadvantage with the open-wheeled car) and a retirement at the Solitude after setting fastest practice time there and leading for the initial laps until the compulsory engine failure. In that race also the second AFM monoposto was entered. This was the car that had been ordered by Emil Vorster with the supercharged 750cc engine. On this occasion it appeared with a 2-litre BMW installed and Hermann Lang in the cockpit. But the engine turned out to be sour and Lang dropped out after only one slow lap. At the end of the season Stuck had a nice battle for the lead at Cologne against the new Veritas Meteor of Kling before he had to retire once again. Von Falkenhausen now concentrated on running his company rather than himself taking part in races and so he appeared only sporadically, like at the Norisring in Nuremberg. As the race was of only 40km of length, this was short enough for the engine to last and so he won this combined Formula 2/sports car event. But he still couldn't make the decision to retire completely and so he built a second Intertype for himself during that season. As can be seen on the picture the car resembled generally the lines of the Formula 2 car, but of course it was a two-seater, and von Falkenhausen installed one of his excellent 1.1-litre engines to enter it in the small sports car class. In spite of the overall similarity to the spaceframe monoposto this car was fitted with a tube section frame instead. It made the car about 20kg heavier, but was much easier to produce. With this car von Falkenhausen had some fun but could not achieve final success. In order to concentrate on his other activities he sold the car to Hanns Roth, who later exchanged the engine for a 2-litre unit and raced it successfully in some sports car events. 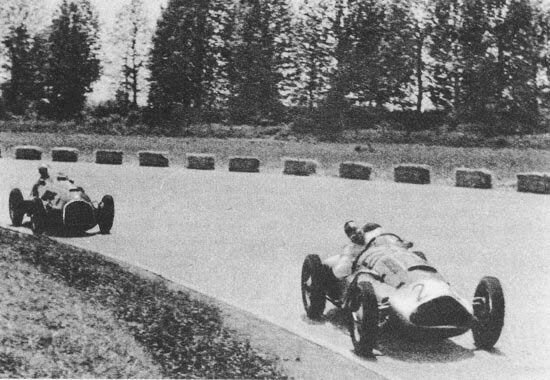 Stuck beats Ascari in the second heat of the 1950 Monza Grand Prix. After Stuck's impressive performance at the 1949 Monza Grand Prix starting money offers were certainly raised and in 1950 the little AFM team was of course keen to reap what they sowed the previous season. The format of the race consisted of two heats with the first six drivers qualifying for the final, while the rest had to start in a repechage. Stuck had to take part in the second heat, accompanied by drivers like Ascari and Fangio. So it again confirmed the driver's and the car's potential when Stuck showed one of his already famous "rocket" starts and shot away into the lead with Ascari closely behind. In spite of the race being only a qualifying heat a fierce battle developed between the two opponents. After all even the winner of a heat would be granted a 100,000 Lire cheque, quite an amount of money at that time, so there was more than simply honour at stake! Benefitting from his better brakes Ascari always closed up at the end of the straights but Stuck, power-sliding as ever, struck back again and again and usually regained his advantage within the long Monza turns. If we can believe the German journal Das Auto the excitement climaxed in best Hollywood style into the last lap, into the last corner, where Ascari managed to pass into the Parabolica, but the AFM's greater torque at low revsaloowed Stuck to tear past his opponent again on the final dash to the finish line. A true Monza race! Inspired by this unexpected success Stuck again took the lead at the start of the final, but soon Ascari and Villoresi managed to pass him. Third place would have still been a big achievement and Stuck managed to keep his position until the engine ran a bearing shortly after half-time of the race. The notorious scourge of the BMW engine had struck yet again! But despite this disappointment Stuck's win in the heat marked the high point of German racing of the period before the return of Mercedes-Benz. It had been a straight victory over Ascari's works Ferrari, it was a deserved one - and it would remain the only one, too. 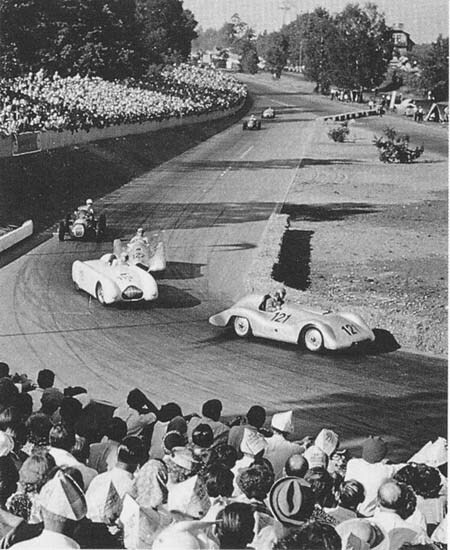 The start of the 1950 Eifelrennen. 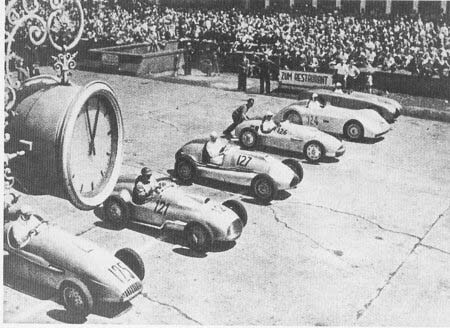 From left to right: Toni Ulmen / Ulmen-Veritas RS Spezial (125), Fritz Rieß / AFM-BMW Type 1950 (121), Hermann Lang / Veritas Meteor (127), Karl Gommann / AFM Type 1950 (126), Karl Kling / Veritas Meteor Streamliner (124), Heinz-Gerd Jäger / Veritas RS-BMW (104). On his way home from Monza Stuck made a stop-over in Switzerland to take part in the Prix de Berne race at Bremgarten. Besides the Veritas trio of Ecurie Suisse the German entries were reinforced by Herrmann Lang in his Veritas and Fritz Rieß, who appeared in a completely new AFM of von Falkenhausen's latest design. Of course Stuck's successes were a very good promotion for AFM, especially as already the first dark clouds had appeared over the Veritas company. 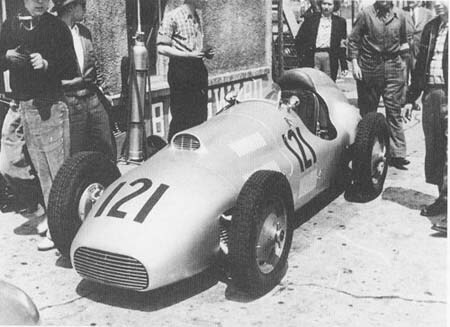 So von Falkenhausen received more and more requests to sell one of his competitive cars and as a consequence already began thinking about a small production series of Formula 2 cars during the 1949 season. Because of his limited resources the new 1950 design of course had to be of less complexity than the space frame car. But a solution was at hand in the form of the 1949 Intertype model with its simple, cheap and easily maintainable tube section layout. This was added with all the other known AFM features: De Dion rear axle, additional transmission, lowered driveshaft, brake-balance system and light-alloy wheels with integrated brake drums. Engines were regularily delivered by Schleicher, who had achieved some fame for his tuned BMW 328 power units. When Rieß appeared with the car at Berne his opponents were impressed by its elegance and soon by its performance too. While Stuck, who again had led briefly, and Lang both had to retire once again the new AFM survived and took Rieß to seventh place at the end. A week later the Eifelrennen took place at the Nürburgring and there Rieß' AFM was accompanied not only by Heeks' older model (which can not be seen on the picture as he was the only one to start from the second row), but also by a second new car, which had been delivered to the upcoming talent Karl Gommann to replace the obsolete BMW 328 he had used the previous season. For some reason Gommann's car was fitted with a different nose-cone which made his car easily distinguishable from the rest of the series, as can be seen on the picture. Of course the German public gave its complete devotion to this first true clash of the two marques. The race itself turned out to be all Veritas disaster and overwhelming AFM success as Rieß won and Gommann finished third while only Ulmen in his privately converted special was able to keep up the pace. The rest had all dropped out, among them both of the new Meteors of Lang and Klenk. Grid of the 1950 Solitude race. Starting order: Lang / Veritas Meteor (127), Stuck / AFM 50-Küchen (129), Greifzu / Greifzu-BMW (131), Heeks / AFM 49 (? )-BMW (123), Ulmen / Ulmen-Veritas Spezial (125), Kling / Veritas Meteor Streamliner (124), von Brauchitsch / AFM 49-BMW (130, hidden by Heeks), Rieß / AFM 50-BMW (121); Gommann / AFM 50-BMW (126). One man was missing at the 'Ring and this had its reasons: Hans Stuck, who perhaps wanted to get rid of the BMW's reliability problems, tried to go his own way. Completely content with von Falkenhausen's chassis designs he ordered one of them without an engine, as he intended to use another power source. During 1949 Richard Küchen, a former chief constructor of the Zündapp motorcycle factory, had begun with the design of a completely new 2-litre V8 engine. It seems that this was originally intended for Brütsch's second car to replace the Bugatti engine, but in the meantime Brütsch had completely lost his interest in racing and concentrated on building up a production series of small cars (see the EBS/Westenrieder chapter). Of course Küchen relied on his experience in motorcycle engines and the result was a 94-degree light-alloy V8 of only 100kg. It had double ignition and was fitted with eight motorcycle carburettors. The claimed power output was about 155hp, certainly good enough to challenge even the contemporary Ferrari V12. Only three such engines were built and Stuck bought two of them. It is reported that he even had to raise money through a mortgage on his home to pay for them. This remark is important as it proves that the AFM-Küchen was completely Stuck's private affair and that he was only an AFM customer. This fact is frequently neglected on occasions when the Küchen engine's failures were connected with von Falkenhausen's "works" activities. Stuck gave the car its debut at the Schauinsland hillclimb, where his time was beaten by Rieß in the half-sister car and Rudi Fischer's Ferrari. The picture above was taken at the start of the next race, at the Solitudering near Stuttgart. With Heeks in the converted ex-supercharged 750cc car and Manfred von Brauchitsch reappearing on the German racing scene in the original monoposto AFM numbers were by now already up to five. But it was Lang who took the pole, and so Stuck had to perform a jump-start again to take the initial lead, only to be passed by Lang during the first lap. Obviously he tried to treat the new engine very gently as soon he was also passed by Kling, Heeks and Ulmen and in the end he finished third behind the Meteors of Kling and Lang - Veritas revenge! 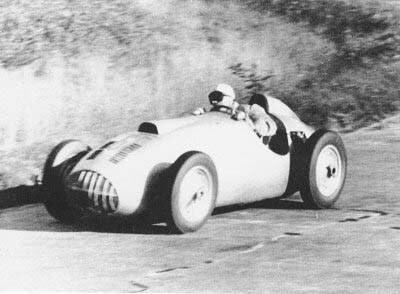 Gommann in his 1950-type AFM-BMW at the German Grand Prix on the Nürburgring. This is a good picture of the specially shaped car. Look at the nosecone to see the difference. The climax of the season was the reintroduction of the German Grand Prix and of course the main interest was whether the new German designs of AFM and Veritas could stand the distance and how they would perform against the best of the international opposition. Leading AFM driver in practice was Rieß, who started from the third row of the grid, clearly beaten by Pietsch's new Meteor, with Stuck, Heeks, Gommann and von Brauchitsch even further behind. In the race Stuck suffered from some technical problems and had to receive outside assistance for which he was subsequently disqualified. Rieß, von Brauchitsch and Heeks also had to retire, so it was up to Gommann to keep the AFM flag up by finishing in seventh place, albeit two laps down to the winner, Ascari. The season neared its finish with the race at the ultra high-speed Grenzlandring. Driving on this track gave a close reminder of American-style oval racing with no need for breaking at all. The race was scheduled for eight laps only, still one too much, as on the last one Gommann could not keep his car on the road and overturned. In those days it was simply impossible to survive a crash at over 200km/h and one of the great hopes of German motor racing was instantly killed. Karl-Günther Bechem in the converted ex-Gommann AFM 50-BMW sports car at the Sachsenring in 1951. What remained of Gommann's wreck was later sold to Karl-Günther Bechem, who used it as basis for a two-seater sports car. The car was ready in time to appear at the Hockenheim race, where he finished fifth behind the Veritas RS cars of Ulmen, Helfrich and Rieß and Niedermayr's BMW special. The picture shows Bechem during the race at the East German Sachsenring, where he took the lead against the usual weak opposition only to retire later in the race. For 1952 the engine capacity was reduced to convert it into a 1500cc sports car. 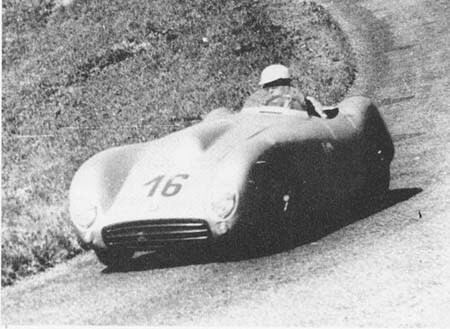 The 1951 AFM 2.5-litre prototype in Coupe version. It seems that von Falkenhausen put his racing activities on the backburner for 1951, as he built two prototypes of a coupe and a roadster, based on a chassis similar to his monoposti and using Opel Super Six engines. One of these cars, shown in the picture, was ordered by the Brazilian government, but the plans came to a sudden halt and von Falkenhausen lost all the money he had invested into this project. So his start at the Marseilles Grand Prix was the last one of his career, as his car failed during practice at the Munich race. The 1951 Avus race: Rieß / AFM 50-BMW Streamliner (121), followed by Helfrich / Veritas RS (119), Pietsch / Veritas Meteor Streamliner (127) and Macklin / HWM-Alta. The car in the back seems to be one of the East German "Kollektivwagen". While Falkenhausen slowly retired from active racing his customers kept busy. 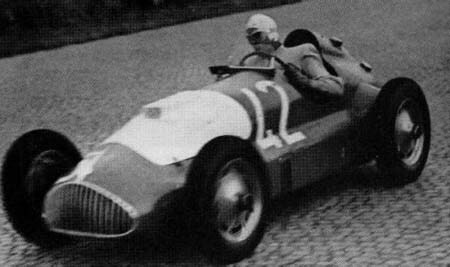 For example Rieß, who made the journey to the Posillipo track together with Ulmen for the Napoli Grand Prix. Information is sketchy, but according to German reports he achieved best practice time, which is not confirmed by my other sources. Be it as it is, it's at least a nice story that Rieß shot away into the lead in best Stuck/AFM manner before being overtaken by Ascari in the early stages of the race. Later he suffered even worse luck when his car caught fire. He managed to reach the pits and bail out, but because of the lack of fire extinguishers the bodywork of the car totally burned out. Luckily for Rieß the next race on the calendar was the Avus race, for which he had already ordered a new streamlined bodywork which can be seen on this photo. Alas, this did not help much, as he had to retire with engine damage, but at least he had stayed in third position for a while. The AFM of Rieß with its new bodywork in 1951. Any ideas "where"? Of course the streamlined bodywork was only suitable for a couple of high-speed circuits so Rieß'car appeared again as an open-wheeler later in the season. Despite of that Rieß was closely beaten by Pietsch for the 1951 German championship. Heeks in his AFM 50 in front of Rudi Krause's Reif-BMW at Halle in 1951. Another faithful contender with the AFM marque was Willi Heeks. His AFM was the last of the monoposto series and it is reported that his old spaceframe car was cannibalised during 1950 to put the new one together. Stuck and his AFM 50-Küchen on his way to victory at the Kyffhäuser hillclimb in East Germany. In 1952 the AFM marque slowly began to disappear from the German racing scene, but with one remarkable exception: Hans Stuck, who was still convinced, that his Küchen-engined car had the potential to play a significant role if only the reliability problems could be solved. After the abolition of Formula 1 he even saw a chance to establish himself again at the top international stage of racing. As a consequence he turned up at the first world championship event, the Swiss Grand Prix. But again all he scored was disappointment and he even passed by on a start at his home Grand Prix. Instead it seems that he fled the competition, concentrating on East German events, where he was safe from international opposition and still superior on many occasions to the locals in their mainly home-built specials, for example winning the race at Leipzig. And he remembered his fame as Bergmeister and concentrated on hillclimb events, repeating his success of 1951 at Aosta-San Bernardo and also winning at Chiusaforte-Sella Nevea and the Kyffhäuser hillclimb, again in East Germany. Stuck's AFM in its final form, now Bristol-powered, at the 1953 Italian Grand Prix. After the many disasters with the Küchen engine Stuck finally perceived the senselessness to carry on with it. Still convinced of the chassis' advantages and realizing the the German engine builders' lacking access to high-quality materials he ordered a Bristol engine for 1953. As this power unit was also based on the old faithful BMW engine, which after all his AFM was designed for, he would not have too big a problem to get it installed. Again Stuck tried to compete on the international scene but achieved little more than collecting some starting money at Silverstone, Chimay, and the Eifelrennen. In the East German races at Dessau, Halle and the Sachsenring he at least managed podium finishes and by the time of his home Grand Prix (from which he dropped out very early during the initial lap) he had already announced his retirement from Grand Prix racing for the end of the season. So his start in the Italian Grand Prix was the last major race of his career and there indeed his car lasted until the end so he finished a distant 18th, 13 laps down on the winner, Fangio. His long career as a Grand Prix driver finally ended at the Bernau race in East Germany with a third place behind the Kollektivwagen of Rosenhammer and Barth. 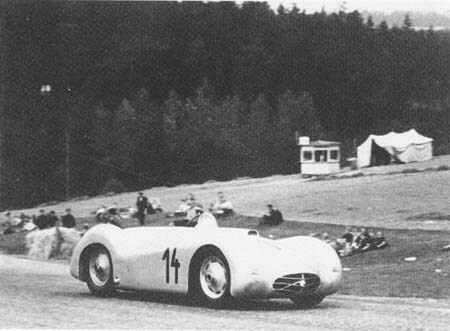 Bechem in the self-converted AFM Sportscar, rebodied in 1952, at the Schauinsland hillclimb of 1953. While generally the AFM marque was on the decline in 1953 this car did reappear on the Formula 2 scene. With factory engagements of Borgward, East Germany's EMW and of course Porsche in the 1500cc class there were no longer any laurels to win for the enthusiastic amateur and Bechem accepted the offer to become Borgward works driver during the season. In his self-converted AFM sports car he installed the original 2-litre engine again to be able to use it in the bigger class. Comparing the picture above with the previous photo of the 1951 season it is obvious that since that time there must have been some facelift for the car, too. 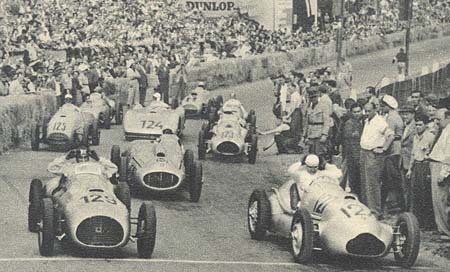 Of course by 1953 the border between Formula 2 and the big sports cars had long become blurred and with decreasing number of entries the race organizers did not support the 2-litre sports car class any longer. 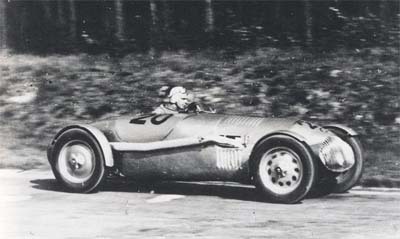 Instead they tended to accept every 2-litre machine for Formula 2, like here at the Schauinsland hillclimb, where Bechem finished seventh, interestingly about 20 seconds slower than he had done before with the Borgward, in which he had secured second place in the small sports car class. 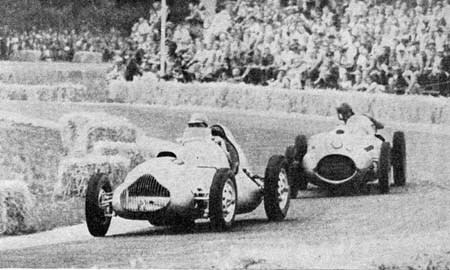 Significant for the current state of Formula 2 was also the fact that the winner, de Graffenried in his state-of-the-art Maserati A6, beat Herrmann's 1500cc Porsche by only 0.06 of a second! In 1954, at a time when Formula 2 had been abandoned internationally, a last refuge remained for the 2-litre cars in the East German series. There, among generally decreasing entry numbers, the AFM marque blossomed for a last time. No fewer than five drivers, all of them from West Germany, appeared in the race programmes: Hans Blees, Helmut Niedermayr, Theo Helfrich, Rudi Bleierer and Hanns Roth. But with the exception of Blees, who campaigned the full season in the car which had formerly belonged to Heeks, I could not identify any of their cars and none of their entry lists is really confirmed to have materialized. Cars with confirmed identity are marked by a "#". completely destroyed / accident 1951 Eifelrennen? entered 1952 German Grand Prix (sports car class)? destroyed at Grenzlandring 1952 (not very likely as most reports tell it was Niedermayr's Veritas! )?